I believe this was the second tape I got from the great F.M. Cornog; hopefully the first one will turn up. Fred’s music is the defining sound of the ’90s for me, and I mean that in the best way. “Helmet On” is, of course, the main attraction here, appearing three years before the epochal single on Sarah Records, but there’s no denying the scathing opener “Shop An Attitude.” Hang in for side two dreams “40 Miles” and “Million, Trillion.” I miss Fred and Barbara; I hope they’re happy. how can I download this tape? Hi Stathis, I am not allowing downloads of East River Pipe music. I don’t think Fred would approve of it. Sorry. Awesome to finally have these missing songs. I saw on reddit a couple of years ago someone had the Kid Colgate cassette but he says he sold it to someone and doesn’t have a rip. So sad, there’s two missing songs from there. I once asked F.M. 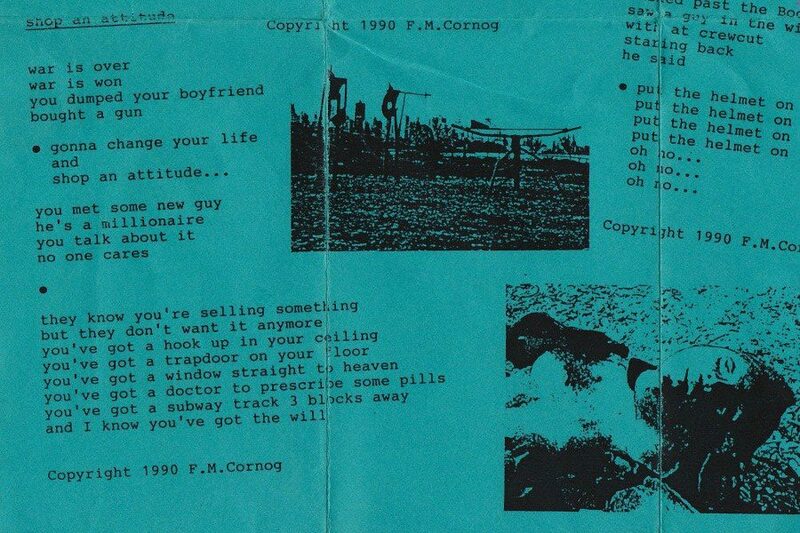 Cornog if he would consider rereleasing this material but he says it embarrasses him too much. But half (or more) of both of his tapes are featured on Shining Hours in a Can and even more on the Merge rerelease, and I think the early songs are just as valid as the new stuff, Helmet On being one of my favorites. Again thanks for the upload. Would be amazed if you found Kid Colgate, would really make my day! Thanks Sean! I am 99% certain I have Kid Colgate around here somewhere; it’s just a matter of locating it. While looking for it just now, I came across the self-titled “red cassette” containing three songs recorded in 1987 and 1988, and released in 1989. 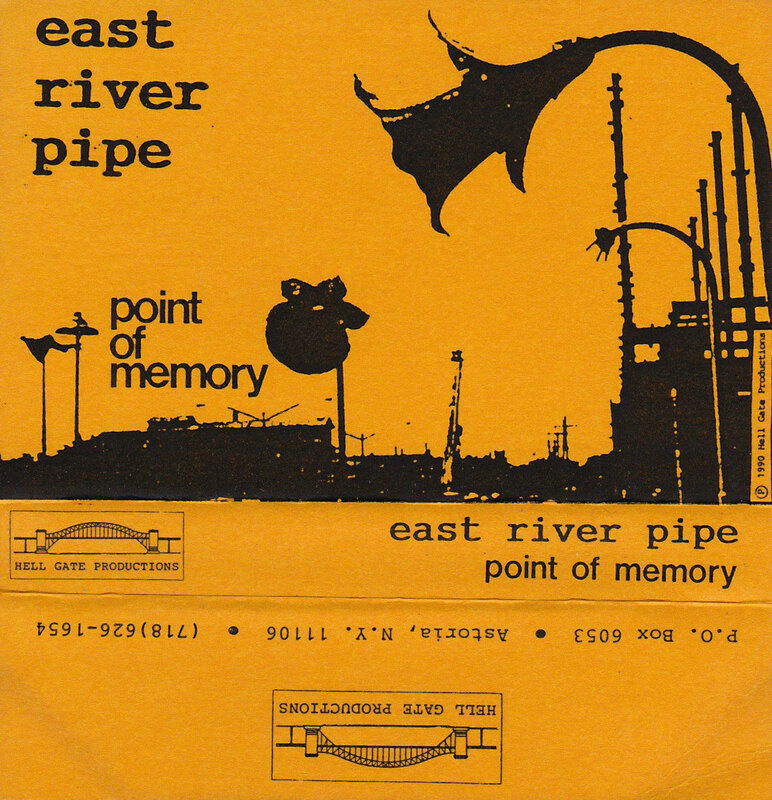 This was the very first East River Pipe cassette, which has come to be known as New York Of Slime, after the title of one of the songs. The other two are “At The Bar” and “Goin’ To Hollywood. I will post these shortly. Stay tuned! Wow, that’s so cool! I had no idea there was a third cassette, I don’t think I’ve seen that listed anywhere.